This entry was posted in Heating, HVAC and tagged furnaces, heat exchangers on March 22, 2013 by . A cracked furnace heat exchanger is a costly fix. Very often it’s more worthwhile to replace the whole furnace. But, as tough as it is to explain to someone that they have a $5,000 problem on their hands, it’s better than the alternative — hearing that the whole family died in their sleep of carbon monoxide poisoning. A cracked heat exchanger is no joke. How a furnace works is a set of heat exchangers, or hollow metal tubes, are heated from within by the open flame of propane or natural gas. Then, air is “forced” or blown over these heat exchangers, which warms the air. 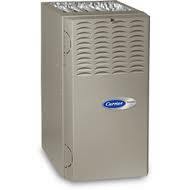 That air then gets circulated throughout the home, through the furnace vents. When a heat exchanger gets cracked, the carbon monoxide (the deadly gas produced by combustion) is freed from the hollow tubes and gets mixed in with the air circulating through the house. Early symptoms of carbon monoxide poisoning include headaches, dizziness, fatigue and vomiting. That’s why it’s very important to have your furnace inspected by a professional every year. Not only are you protecting your family from these dangers, as well as the lesser risk of having the furnace conk out, you may be able to catch repairs early enough that you don’t have to replace the whole system.